PHNOM PENH, July 24 (Xinhua) -- The Cambodian Senate, or the upper house, on Friday gave final approval to a controversial draft Law on Associations and Non-Governmental Organizations (NGOs) after the National Assembly, or the lower house, passed it 10 days ago. Forty-four senators from the ruling Cambodian People's Party ( CPP), who were present during the debate, unanimously supported the bill by raising hands, as the 11 senators from the opposition Sam Rainsy Party (SRP) boycotted the session. The SRP was merged with the Human Rights Party in 2012 to form a strong opposition Cambodia National Rescue Party, but SRP's senators will still hold their seats in the Senate until the next Senate's election in 2018. The Senate comprises 61 seats. It needs a 50 percent plus one majority vote, or 32 votes only, to grant final approval to a law. While the Senate was debating the bill, about 300 of opposition, human rights and NGO activists protested against the bill in front of the Senate. They claimed that the law would impose restrictions on the freedoms of associations and NGOs. However, CPP's senator Ouk Kong said"The law does not aim to restrict the freedoms of associations and organizations; instead, it will protect the rights and freedoms of those organizations and enhance cooperation between the organizations and the government." 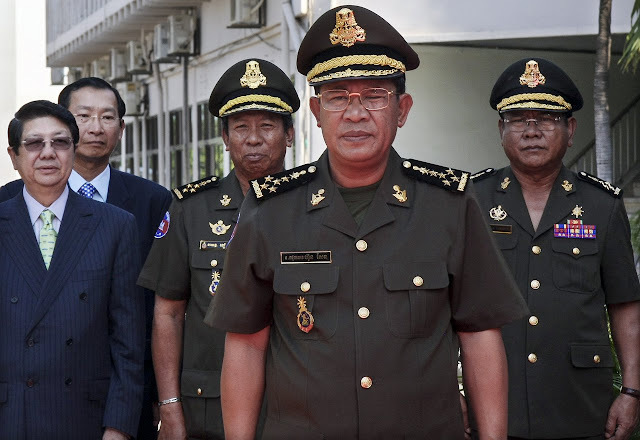 Prime Minister Hun Sen said in June that the law targeted to fight terrorism financing, money laundering and creation of illegal armed forces. "Associations and NGOs should not worry about this law. It will protect you, support you, and open up to your activities,"he said. According to the government's figures, currently, there are approximately 5,000 associations and NGOs operating in this Southeast Asian nation. Under the law, associations and NGOs will be required to register their nationalities with the government in order to have legal standing and must file reports on their activities and finances each year to the government. It will also allow the government to delete the name of any association or NGO, which has conducted any action that jeopardizes peace, stability and public order, or harms national security, unification, culture, traditions and custom. The law will be submitted to King Norodom Sihamoni for promulgation.